It's been a full year since we started the process of removing Ellie's hemangioma and correcting the way her forehead looks. She just had her second surgery to further correct it, and the incision looks really promising! 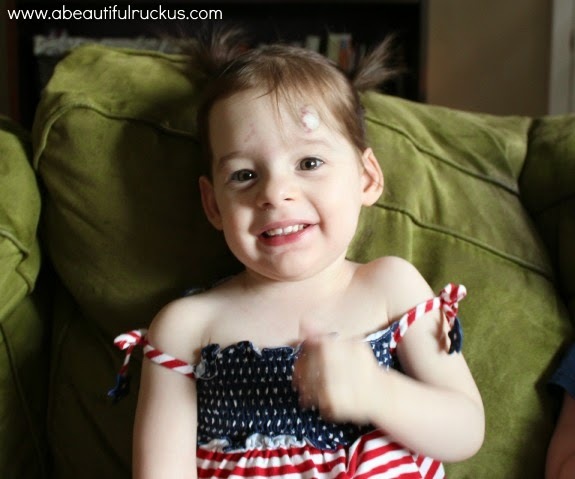 Ellie was born with a hemangioma over her left eyebrow. They are fairly common in little kids, but the reason why you don't see a lot of them on adults is because most shrink and fade by the time kids reach kindergarten. We were seeing a pediatric dermatologist for a couple of years after Ellie was born to monitor how it was behaving. A few months after she was born, it ulcerated because of accelerated growth. The poor little girl was in SO much pain. 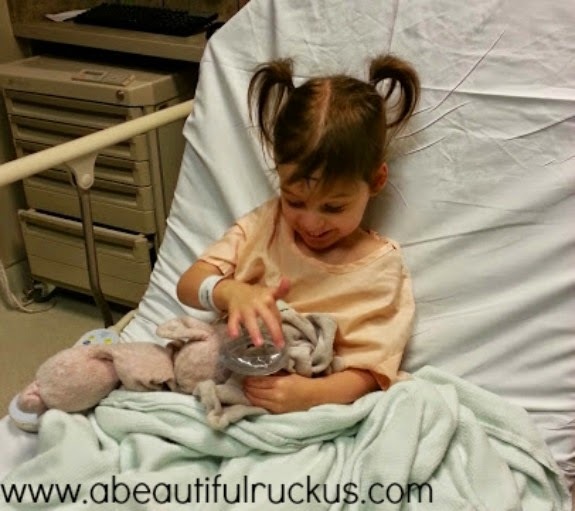 I felt like the worst mother ever for not catching on right away to what was causing her so much discomfort. 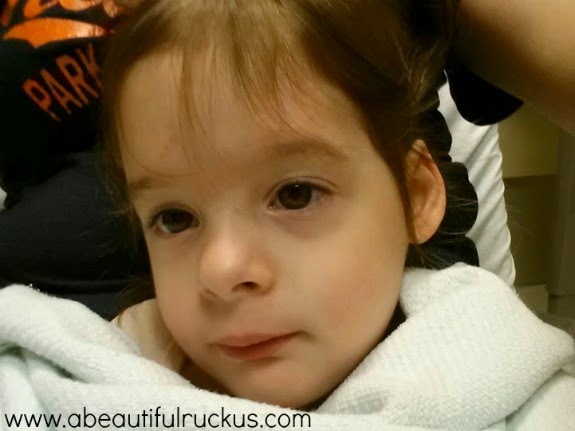 We were eventually able to clear it up by treating it twice a day at home (it was severely painful to her) and she was put on a drug called, Propranolol to help slow the growth. 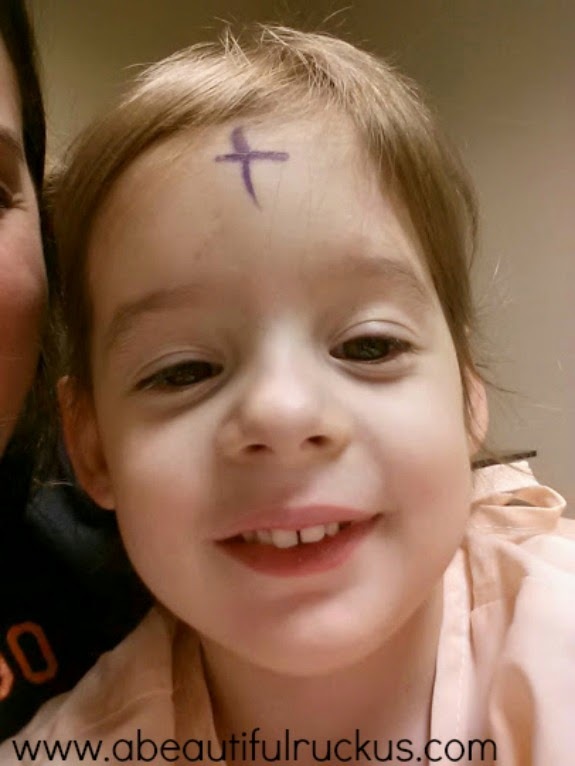 Unfortunately, when we she stopped taking it, her hemangioma immediately began growing again. Something wasn't right, and all dermatology wanted to do was watch it. So we took her for a second opinion with a plastic surgeon, and he immediately told us that it needed to be removed. Hemangiomas are benign tumors, and she had a sub-type that would grow continually until it was surgically removed. I am SO glad that we went with our gut and looked for a second opinion! Because of the location of the hemangioma and how large and deep it was, Dr. Andrews suggested a two-part surgery to give her the best chance of looking normal. 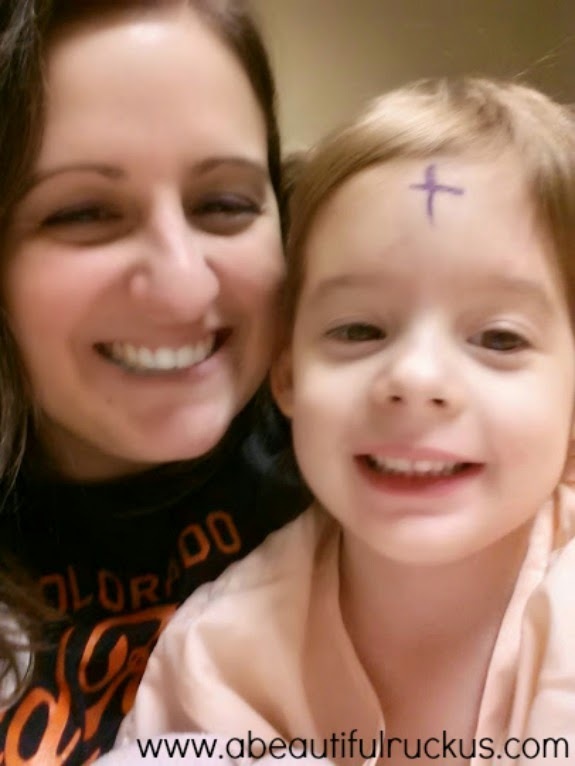 Last October, we had the first surgery which was the removal of the hemangioma. At the time, he used a "purse-string" closure to cinch the open wound closed. 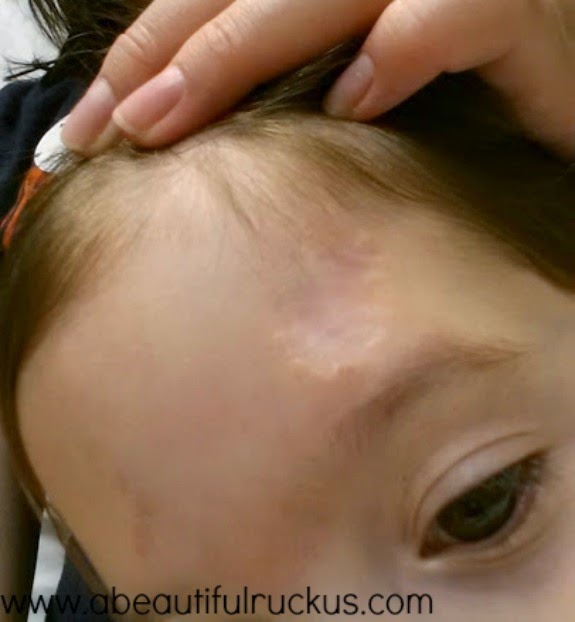 With the hemangioma taking up such a large part of her forehead, a straight suture would have permanently pulled her hairline down and her eyebrow up. Since we were going for a less-unique look, we definitely wanted to do the two-step surgery to help her look natural. It healed well, but the scar was large. Her hair covered it most of the time, but when she crinkled her nose or cried, it was very visible. So we knew we wanted to pursue the 2nd surgery for her. And now you are officially caught back up! We could have done the 2nd surgery 6-8 months after the first one, but it was recommended that we wait until summer was over. The sun can cause problems with healing scars, so we thought we'd wait until more time is spent indoors. With fall arriving, it was finally time to go back and finish what we started. The only problem with fall surgeries is that I knew we would be running the risk of Ellie getting sick with something. Sure enough, we very narrowly got to keep our surgery appointment. Ellie always gets the short end of the stick when it comes to illnesses. She is our Baby D, was the smallest at 1 lb, 14 oz, has asthma, and deals with all of the other preemie lung stuff that my other kids deal with. She is always the first to get sick, and always gets the sickest out of the bunch. Every cold she gets ends up turning into something more and requires her albuterol inhaler, nebulizer, antibiotics, and steroids to clear her lungs again. Of course, she came down with a cold the Saturday before her Thursday surgery. She has been so healthy too! I REALLY didn't want to push the surgery off any longer. With her being in preschool and our insurance maxed out between my broken leg, multiple rounds of bronchitis, Elijah's split chin, etc, I wanted it done before January 1st rolled around. The anesthesiologist asked if she would like some "candy gas." He scented her breathing mask with pink bubblegum lip balm and handed it to her so that she could smell it while they were wheeling her back. He was so great with her and took the scariness right now of the situation. Uh...who doesn't want to go get some candy gas?! So I pulled out my essential oils and started oiling that girl down 3x a day, and prayed that they would provide enough immune support to help us. I'm happy to say that within 48 hours (on Monday), our surgery odds were improving! On Tuesday, I took her to the pediatrician to have her lungs checked, and he cleared her for surgery. When the anesthesiologist listened to her lungs on Thursday morning, there was no sign of the cold she had been battling over the weekend. Yay! Surgery was a go! We were going to get to cross this item off of our to-do list after all! The surgery was simply a scar revision. Because of the way the "purse-string" suture healed, Dr. Andrews cut all of that scar tissue out and turned it into a straight line suture. Something that will be a lot less visible and if necessary, can be easily covered with makeup as she gets older. A little rough looking on the other side of surgery. 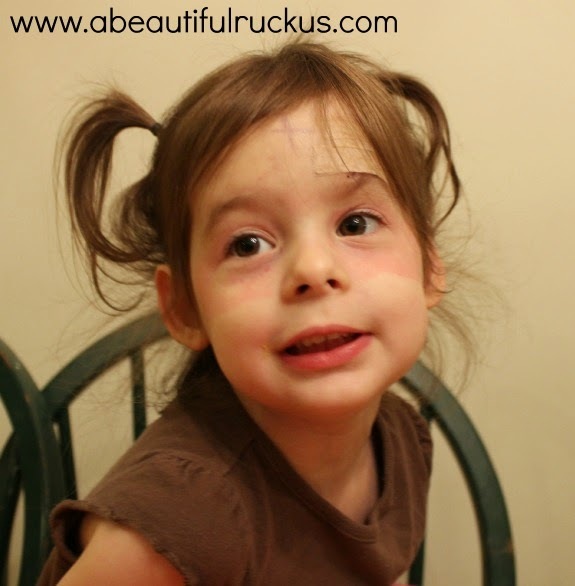 The adhesive tape that they used over her eyes left its mark. We've been warned that there is always a chance that it could grow back if the Dr missed any part of the tumor. He said that when he was in there, it looked good though. He also told us that he can correct the scar even further in the future if we want him to. 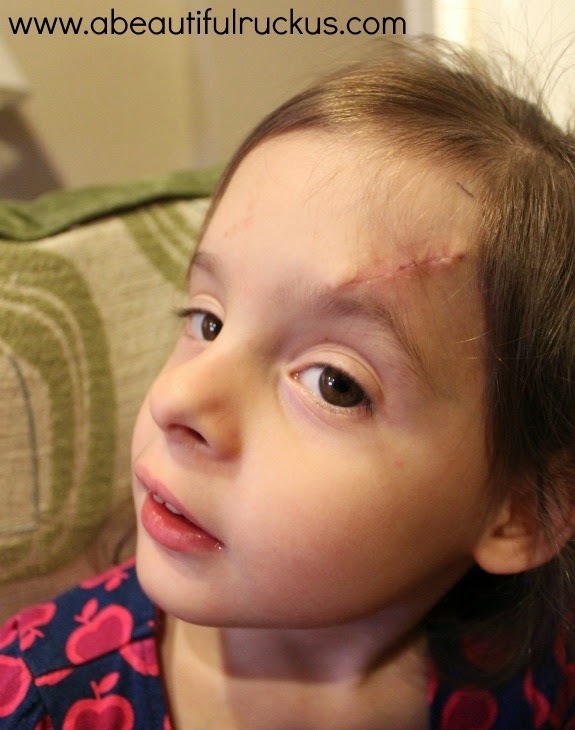 Right now, the scar will be at a slant across her forehead, rather than the straight line he was hoping for. We really don't think that a 3rd surgery to fine-tune it will be necessary, but I've also been a 16-year-old girl, so I suppose we can address that in the future if it really bothers her. I think she will be just fine though. She is young and the scar should fade by the time it matters to the teenaged version of Ellie. For now, I'm calling this process complete. Her eye brow will relax over the next few weeks as the skin heals. It will be a much smaller scar now. 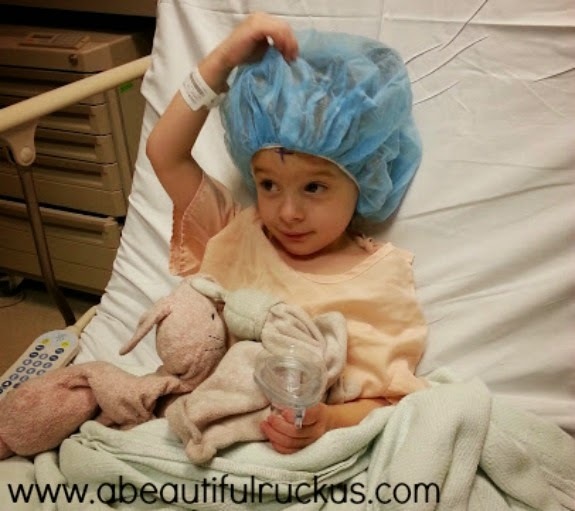 With this surgery comes a major milestone for our family. This is the last of the preemie fixes that we needed to pursue, and we can move on to other things now. Granted, we will still be dealing with some residual preemie related issues (like Caleb's autism), but all of the major, fixable, specialist items have been checked off the list. Frankincense may help lessen the scarring further. Wonderful! btw, I take propranolol for my migraines, so this was a good reminder to me to keep taking my meds even if I feel better. Isn't medicine great when it fixes the problem you take it to cure? Isn't our Creator God amazing in His intricate design of our bodies? !